Perhaps it was the time when I was a student in Colchester that I realised I would spend most of my life arguing with others. The worth of 1984 or the relative merit of Bob Dylan and Elvis Presley, I was never short of subjects. Colchester is ranked the 87th best place to live in Britain and has nearly five hours of sunshine a day. My shame is that all I remember is earnest argument and alcohol. Essex Police produced a Crime in Context report that stated Colchester might be the fastest growing town in Britain but it was not becoming a ‘town of violence that could ever be compared to a city like Liverpool.’ God forbid, Liverpool. But the ample number of nightclubs provides employment for those proficient in violence. The 24 Hour Gym, Anytime Fitness, helps the bouncers preserve muscles. The famous Jumbo water tower also has muscle, over a million bricks. The impressive Jumbo is not in my memories. These relate to escape – the three cinemas, pubs, the bus stop and the railway station. Trains in peak times take less than an hour to reach London. That and Essex University explain the population growth. Colchester is the oldest town in England. The name sounds Roman for fortified colony but the name may be derived from the Celtic named Colne valley, once home of hunter-gatherers. These ancient folk existed before the discovery of alcohol persuaded the human race to adopt agriculture. It is a theory. The Castle is 11th Century Norman and impressive in a small city. The French monument appreciates a climate that produces five hours of daily sunshine. The Army presence in Colchester expanded during the Crimean War. Prostitution was a problem but reduced after a canteen was built in the barracks. Never knock the importance of a cup of tea. If the Essex Police show fear of Liverpool, the splendid Mercury Theatre is showing Educating Rita this month. It is too simple to imagine North and South being exemplified in Colchester sophisticate, Damon Albarn, and Manchester mouth, Noel Gallagher. 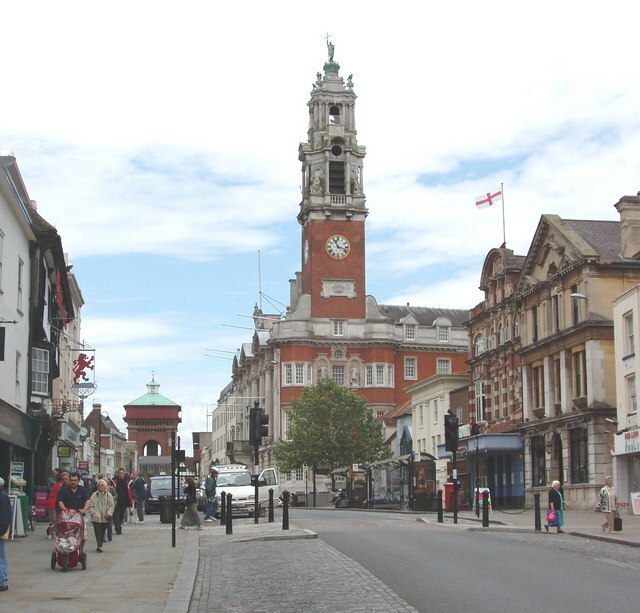 22% of the residents of the Colchester are identified as working in knowledge occupations. The University of Essex is located in nearby Wivenhoe Park, which was painted by John Constable. Although fundamental to a University defined by brutal architecture, the location can be recognised in the painting. This is not true of the nearby heritage preserved Flatford Mill although rowing down the river to the Mill is a real pleasure. Next week, Lancashire’s own Happy Valley, Colne. Posted in Animal Farm, Bob Dylan, Book 1984, Colchester Mercury Theatre, Damon Albarn, Educating Rita, Elvis Presley, Essex Police, Essex University, Flatford Mill, George Orwell, Jon Constable, Noel Gallagher, Yevgeny Zamyatin and tagged Britain, Culture, Society, travel, UK history on March 14, 2015 by Howard Jackson.